ETHERA’s technology is the result of nearly 10 years of research in a CEA/CNRS laboratory. It is protected by several patents, and is based on ETHERA’s unique experience in nanoporous materials engineering. The materials are produced using an established Sol-Gel process. Their porosity results in a very important surface area, allowing them to trap large quantities of the targeted gases. 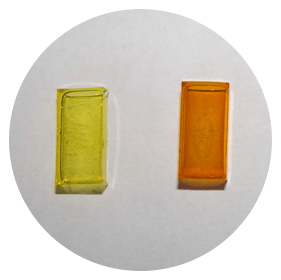 Thanks to specific colorimetric reagents, the detection of the pollutants is made possible, based on the color variation of these initially transparent materials. The reading can be performed visually or with an optical reader for more accurate results. This technology is embedded in our monitoring, diagnostic IAQ stations and treatment solutions.